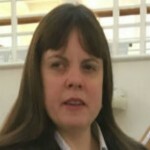 I have been a criminal barrister in the Crown Prosecution Service (CPS) since 2008, having worked for a number of years before at the Manchester Bar. The CPS was attractive for a combination of reasons, including the quality of the work I’d be able to get involved in. It is really satisfying to have conduct of a case and prosecute it from start to finish - from first hearing in the Crown Court all the way to trial, building the best case you can with the evidence you have. As well as the professional satisfaction, I made the change because of the attraction of public service. To me, this means giving my absolute best at all times and hoping that what I do will make a difference. The Civil Service offers an unparalleled breadth and variety of work and opportunities. In the CPS, my criminal law practice covers cases that range from drugs and organised crime, to very serious sexual and violent offences. Working in the CPS has enabled me to consolidate a strong network of colleagues in Manchester, while building good professional relationships with others in all areas of the Criminal Justice System. Lisa Boocock and her guide dog Bess. I am blind, and the Civil Service has a policy of supporting and encouraging employees with disabilities, and from day one they were very inclusive. As a criminal barrister, all I've ever asked professionally is that I am treated in the same way as my sighted colleagues - and the CPS has always done this. However, where necessary, the Civil Service is happy to make reasonable adjustments. For example, at interview, I was asked in what format I would like the interview questions. I do not use Braille and use the same laptop as everyone else, but equipped with a speech synthesizer that ‘reads’ text on the screen through a discreet earphone. Every morning, I arrive at court early. Last-minute developments in that day's cases mean you really do need to be able work quickly and think on your feet. If I'm dealing with a trial, I need to find my opponent and establish whether or not the trial will be effective -- the defendant can change his plea at any time, meaning that the trial may go short. Many witnesses can be apprehensive, especially if they’ve never been to court before. So, if I have witnesses I make a point of introducing myself, explaining court procedure and trying to relax them. It’s a challenging and rewarding job. Some days I may have several cases to prosecute, and this can involve a lot of running around to resolve disclosure issues or find out information the judge might want if the case is going to be sentenced. After court has finished, I start preparing my cases for the following day, taking work home when I need to. When you are on your feet in court, you alone are responsible for the case you are presenting, and you need to make sure you know every case inside out. Preparing a case properly can mean many hours of work. But all that preparation really does pay off. 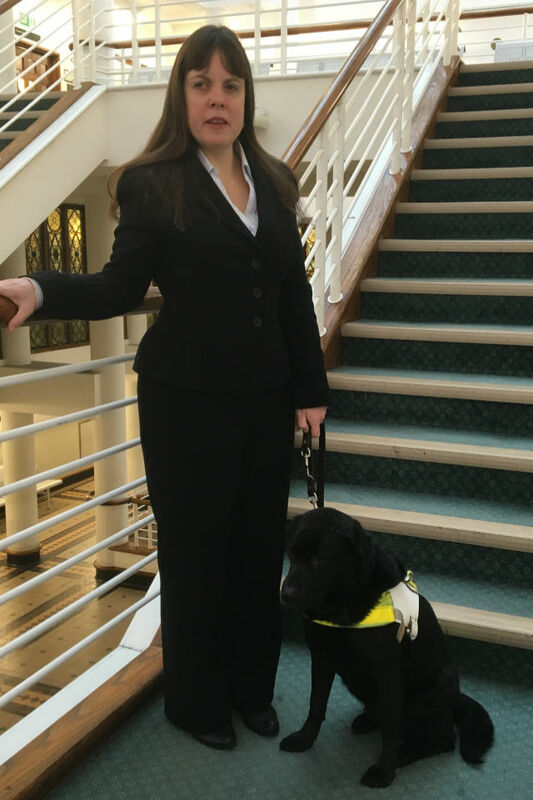 My guide dog Bess comes into court with me and she definitely has her favourite judges and counsel! I have my own role models in the law. When I was a junior counsel, I found the Right Honourable Lady Justice Anne Rafferty, DBE, PC, a really impressive and inspiring judge. At that time, she had not long been a High Court Judge and female judges were rarer than they are today. Now, it’s great to see more gifted women in our courts and rising to the highest ranks of the judiciary, but we still need more women in these positions to make our justice system fully reflective of wider society. In my experience, the Civil Service is a great employer. It offers a huge range of opportunities, you can pursue virtually any career you want and will be supported by your colleagues and encouraged to develop your skills - whoever you are. Thanks for sharing your story. As a parent of a child who has been recently diagnosed with a degenerative sight condition I am always keen to hear from those who have not allowed their disability prevent them achieving what they want to achieved. I wish you every success in the future. Fascinated with this, very interesting comments about your work. Hope you don't mind me saying, my son's girlfriend is also blind and a fully qualified and practicing physiotherapist. I will be passing her your article, she will be very interested, as I'm sure will everyone who reads it. What an inspiring story.Now i am disable due to stroke and my life has changed.I think if you work with your disabilty so can any one.I used to teach Indian Cooking at Adult evening and a lady with the same disabilty as yours attended all 6 classes and if you all can work so can I. Incredible woman, thank you for sharing. As someone who had an older brother who was blind from birth, this is a very sobering article. It is an irony and a shame that The Guide Dogs for the Blind Association receives no government funding; a guide dog on average costs around £50,000 through its lifetime. Lisa says that "the Civil Service has a policy of supporting and encouraging employees with disabilities" but, other than that being an official mantra, is that what she has noted as being practised generally or is she referring solely to her own experience? I would have thought that the public sector isn't broadly all inclusive, which is exactly why certain groups are under represented or unduly discriminated against, although I do acknowledge that there has been a lot more momentum towards greater equality in recent years. She also says that in the Civil Service "you can pursue virtually any career you want and will be supported by your colleagues and encouraged to develop your skills - whoever you are." I think I've seen both extremes over the years; it largely depends where/who you are, what you're doing and your aspirations. This is a truly inspiring story from a personal perspective. It seems though we have to touch on equality and diversity. The CPS itself cannot be seen to be 'broadly inclusive' of society when 66% of the staff are female - doesn't sound 'inclusive ' to me. Once again equality means why are women so under-represented at the top but not at the same time, why are are men so under-represented at the bottom. Lisa, Thank you for your personal story. I have been really impressed by the way in which you have simply got on with your job and have been successful. What has also been pleasing for me is that this is tangible evidence that my sponsorship of a Guide Dog is going to make a significant difference to the life of someone and enable them to live a fairly normal life. I did like the fact that Bess has a favorite Judges and Counsel! as a Champion of Wellbeing, could I ask what you do to relax after a challenging day in court?